The order of Henry The Lion was founded by the present reigning Duke William on the 25th April, 1834. The object is given in the introductory remark of the patent, "to reward those who have distinguished themselves in our service, military or civil, in war, or the arts and sciences". No regard is, therefore, had in the distribution, to birth, rank, or religion, except in the higher classes, when a previous possession of a Knightly cross is required. The Order consists of four classes. Knights of the Grand Cross, Commanders first and second classes, and Knights. The reigning Dukes of Brunswick are Grand Masters. 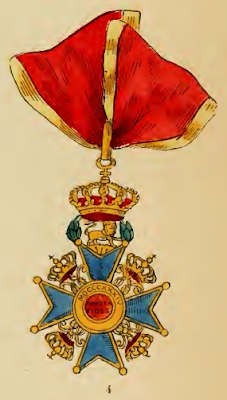 The badge consists of a golden octagonal Cross, enamelled bright blue, with gold balls at the points and with a red middle, bearing on the obverse the helmet of the Brunswick Arms so as to allow it to rest upon the lower wing of the Cross, while the crowned pillar with the galloping horse, together with the two sickles, are placed in the centre; the feathers of the peacock are represented upon the right and left wings, and its tail, together with the star, upon the upper wing of the Cross. Above the Cross is a gold lion passant between two laurel branches covered with the Brunswick crown, while between the wings of the Cross is a gold W also covered with the crown. The reverse has in the red centre, the motto of the Order in gold letters, "Immota Fides" (Immutable faith), encompassed by a golden ring, with the year of the foundation MDCCCXXXIV. 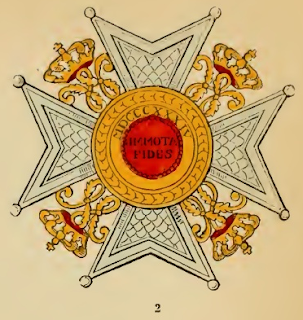 The front of the Order is seen No. 3, and the reverse No. 4. It is worn in different sizes, suspended by a deep red ribbon (of equally different widths) with narrow yellow stripes, by the Knights of the Grand Cross across the left shoulder towards the right hip, by the Commanders round the neck, and by the Knights at the button hole. 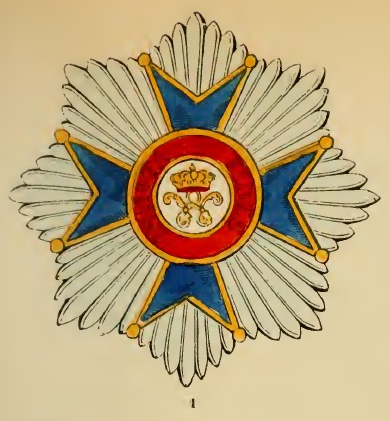 The first two classes have besides the following insignia, as special distinctions, an octagonal star with silver rays encompassing the golden bright blue enamelled Cross of the decoration, while the centre shows a golden W covered with the crown, as also a red ring with the motto of the Order in golden letters, which is worn by the Knights of the Grand Cross upon the left breast (No. 1). The Commanders of the first class wear, likewise, upon the left breast an octagonal silver Cross, between the wings of which is the gold W equally covered with the ducal crown (No. 2), while the red centre bears the motto of the Order in gold letters, encompassed by a gold ring with the date of the foundation of the Order in it. The Knights of the Grand Cross are, moreover, allowed to wear, on high gala days, their decorations round the neck by a gold chain, the links of which consist of three parts ; of the escutcheon surrounded by flags with the two fields of Brunswick and Liineburg, of two golden lions pacing towards the escutcheon, and of the centre of the star of the Knights of the Grand Cross (No. 5).